In scenes reminiscent of 1960’s Birmingham, authorities have been using water cannons & attack dogs on water protectors in North Dakota. 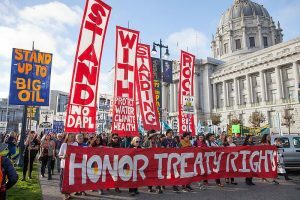 The story of Standing Rock is everything wrong with America: Following hundreds of years of dehumanization and genocide, we’re breaking our treaty with indigenous tribes and ripping up their burial grounds. 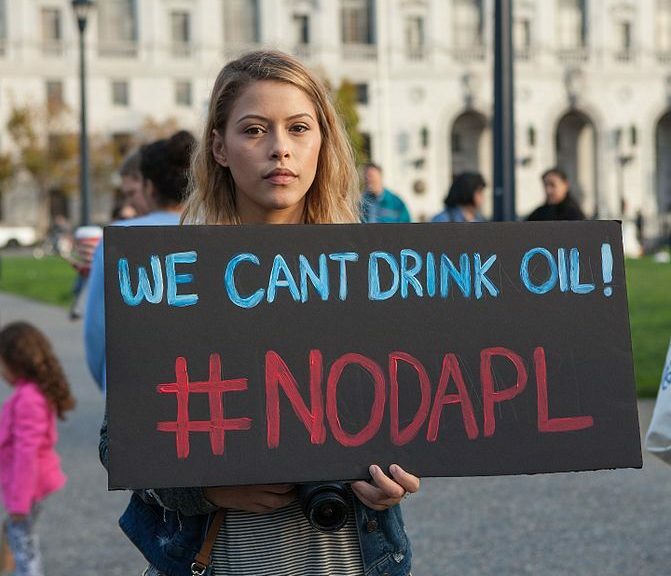 Armed thugs are bashing skulls of water protectors at the behest of oil companies. Spineless Democrats like Barack Obama & Hillary Clinton have barely been bothered to offer tepid remarks. And corporate media is ignoring the entire thing. For a quick overview: the 1851 Treaty of Fort Laramie states that a large area, including Standing Rock, belongs to indigenous people. Then, in 1877, congress decided to ignore our treaty and seize much of the land. In 1980, the Supreme Court ruled that the government was in the wrong, and ordered a $102m settlement. The settlement money has been accruing interest ever since – now worth $1.3b. 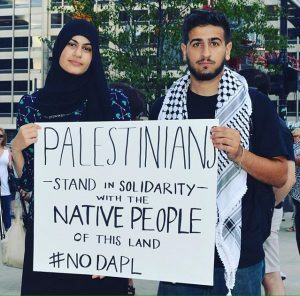 But the Standing Rock Sioux don’t want our money; they want their land. 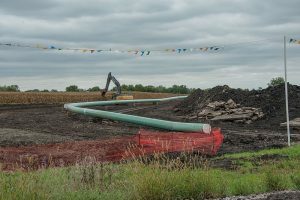 Now, an oil company wants to build a pipeline from North Dakota to Illinois, which has been bankrolled by Wall St. It was supposed to pass by Bismark, but the nice, white people there didn’t want their water poisoned, so Energy Transfer Partners (ETP) decided to use Sioux land instead. After all, it had been taken from them long ago. 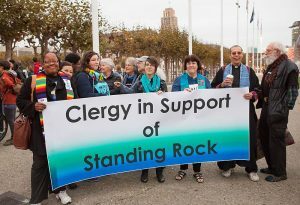 Water protectors, well aware of the tendency of pipelines to leak, established Sacred Stone prayer camp at Standing Rock Sioux Reservation in April. 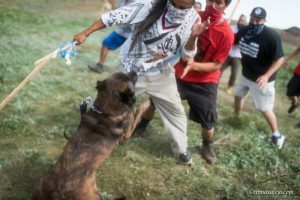 Unarmed and peaceful protectors were initially met with attack dogs unleashed by oil mercenaries. 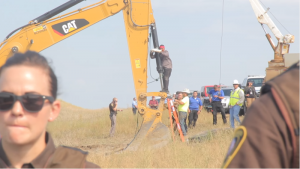 An agent provocateur – a bandanna-faced ETP employee armed with an assault rifle – was unearthed by water protectors, which culminated in a tense standoff. Those sickening scenes should have been enough to coax a reaction out of docile Obama. But au contraire – the president said he’d wait and see. Governor Dalrymple declared a state of emergency, and cut off water and sanitation services. 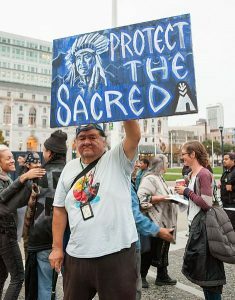 Five states allocated millions of dollars to sic militarized, skull-cracking cops on peaceful protectors. Armed thugs with badges descended upon the prayer camp in bomb-resistant war vehicles. They beat women and children. They used tear gas and sound cannons to physically torture unarmed people. They shot a young girl in the eye with a rubber bullet. 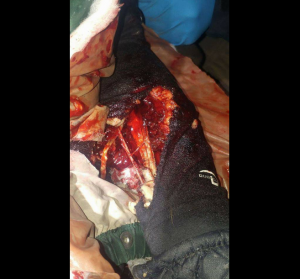 They blew a young woman’s arm apart with a concussion grenade, and blamed the water protectors. When the concussion grenades resulted in fires, cops blamed protectors and let the fires burn without allowing the fire department access. When the weather began to freeze, cops paired tear gas with water cannons to increase the physical torture. Oil cops placed burning vehicles in the roadway which blocked emergency vehicles from reaching people suffering from mass hypothermia. 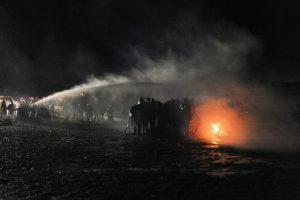 Fires built by protectors for heat were targeted by oil cops operating the water cannons. 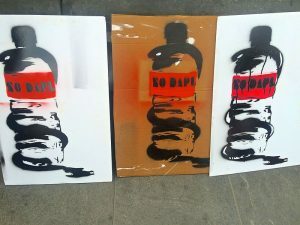 Cameras, footage, and storage devices have been confiscated by oil cops. Social media feeds have been disabled by complicit Silicon Valley companies who feign ignorance. The UN is formally observing the situation for human rights abuses, but the view of Amnesty International observers who arrived was blocked. Mainstream corporate media parrot the lies of law enforcement when not actively engaged in see-no-evil. 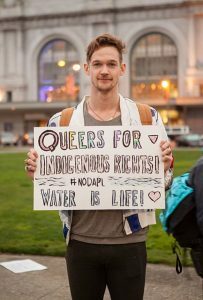 Despite the corporate media blackout, social media feeds have filled with sentiments of support for the water protectors. 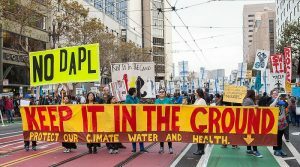 Amy Goodman of Democracy Now went to report on Standing Rock and was arrested, as were documentary film maker Deia Schlosberg, Green Party presidential candidate Jill Stein, actress Shailene Woodley, and numerous Unicorn Riot reporters – who’ve supplied a steady stream of video throughout. Reporter Jordan Chariton of the Young Turks has gone numerous times to document the ugliness. New York Daily News writer and civil rights activist Shaun King has offered eloquent words. In early December, hundreds of veterans will offer themselves as human shields. We must stand in unison and declare that we will not abide the atrocities and war crimes being committed in our name, with our tax dollars, and on our watch: Attack dogs ripping flesh from peaceful protesters. Water being weaponized against water protectors. Oil police pointing their guns in the wrong direction. Multinational corporations bullying the people via the US government. Obama standing with the corporation and opposed to the only ethnic group who’ve been mistreated by the United States more than Black folks. And an acquiescent corporate media who’ve been paid billions in hush money by Big Oil in the form of ad buys.